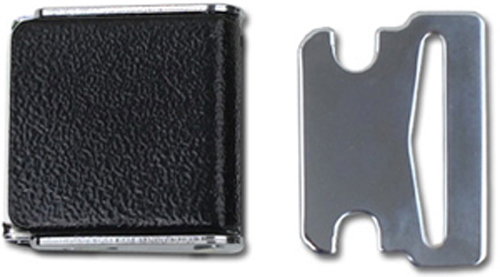 Set includes a matched chrome latch end. Not guaranteed to match an existing seat belt. Includes end release cable buckle with matched latch end. Measures 11 1/2" long x 2 1/8" wide with a 1 7/8 recess for the seat belt buckle. Not guaranteed to fit existing seat belt buckle. Color is not guaranteed to match an existing seat belt,buckle or interior conponent. Sold Not Returnable For product questions or ordering assistance call (302)629-8508.